Father and daughter duo Eamon and Clare Martyn were moving bales recently, with Clare getting plenty of work done on the farm. 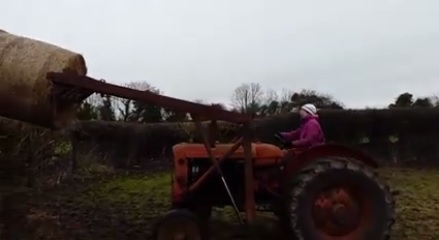 In this video Clare is driving the tractor, with Eamon filming and directing. After a nervy start, Clare gets the hang of the tractor and hits the throttle – with plenty of smoke ensuing. “What about the environment? Come on get stuck in,” Eamon tells her. “I can’t breathe!” Clare shouts after she gets the tractor moving at a steady pace. Eamon isn’t having any of it and eggs her on further. Once Clare gets the tractor and bale to the feeder, there’s more work ahead of her as she has to tip it. After some elbow grease, she tips the bale into the feeder – but her work doesn’t stop there as her father has more lined up for her going by this video! Ok come on, none of this modern stuff, away you go. This tractor is for real women, none of these feckin’ office girls. Clare has captioned the video; When your Dad wants to sell you off to an Irish Farmer. With his version of “What Men Should Be Looking For In a Woman”. We hope a farmer with plenty of road frontage has taken note!